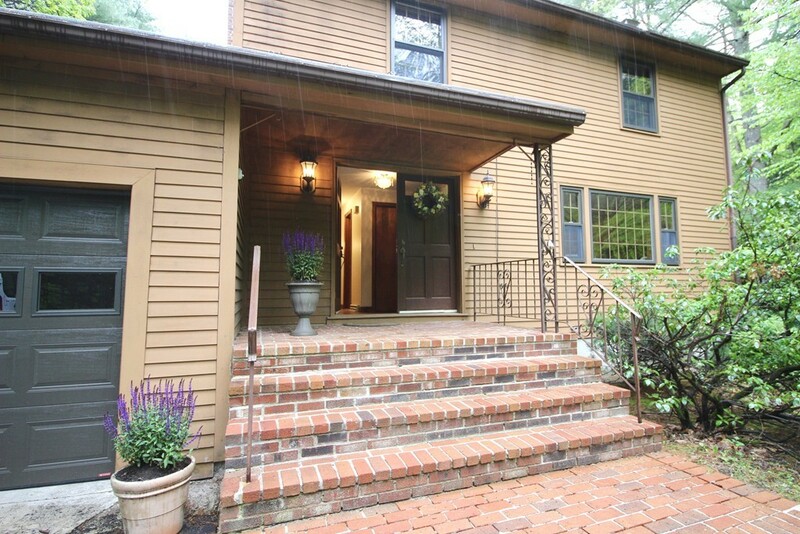 RARE OPPORTUNITY - this is the first time this custom colonial has been on the market. Set far off the road on almost 2 acres of wooded, park-like grounds, the home provides a quiet retreat into natural beauty. Enter the main floor to find the foyer, flanked by a fireplaced living room and staircase. The dining room flows seamlessly from the living room, lit by a sparkling crystal chandelier by night and natural light by day. The eat-in kitchen, featuring a double oven and cooktop, stainless refrigerator and dishwasher, overlooks the sunken family room with new pellet stove, wood flooring and sliders to an oversized deck. Heading upstairs to the second floor you will find 4 bedrooms and 2 bathrooms. The spacious master bedroom overlooks the magnificently private wooded grounds. Heading downstairs to the basement you'll find a great open space for storage. Notable pluses include gas heat, central air and security system.